Since I have been talking about alain Ducasse and that he is one of my favorite chefs, and one of the most prestigious in France with its 14 Michelin stars, I thought to present one of his recipes that combines the flavors of Western cuisine with the technique of Asian cooking. His cuisine uses an abundance the freshest seasonal ingredients and harmony of flavors. I think I will throw some of his recipes occasionally, because they deserve to be more exposed among the general public. In the US, obviously, people are more familiar with American or British chefs, and Alain is one my favorite chefs of all. As much as I love to make traditional Italian ravioli, or French ravioles, Asians ravioli have their own particular personality and character. I did not change anything to its original recipe. I have been looking at this one for a while and never tried making it. Usually I like to create things on my own and experiment new recipes but when it has to do with Alain Ducasse, his style of cuisine “me parle” speaks to me in a way that I completely feel in symbiosis with it, and if I use his recipes, I leave them the way they are. Actually, Alain is not longer French, he became Monégasque, which means citizen of Monaco, and gave up his citizenship but we do love him anyway. The particularity of this recipe is that the ravioli stuffing is using Western ingredients but are steamed, often used in Asian cuisine and dipped in a pungent balsamic-soy sauce. It’s quite an easy and simple dish but with the right ingredient combination to get that exotic-but-not-so-exotic-touch. Besides, unlike Italian ravioli, you can use wonton wrappers and don’t have to make your own pasta dough. That cuts the preparation time and is the secret to this wonderful but yet quick dish. Start making the filling. In a bowl, mix tomatoes, olives, shallots, spring onions, sundried tomatoes, salt and pepper. 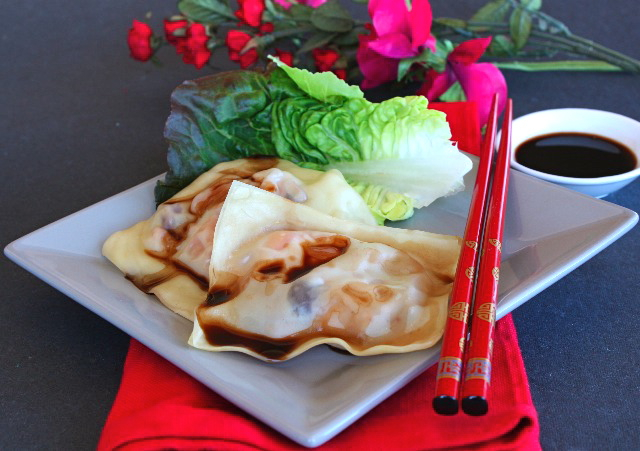 Using a wonton wrapper, place 1 tsp or 1 small tbs of filling in the middle of the wonton. Use egg and cornstarch mixture around the dumpling. Place another wrapper on top and using your hand, press firmly on the edges to seal wonton. The egg and cornstarch will seal the wonton. Mix balsamic vinegar with soy sauce. Using a bamboo steamer, place cabbage leaves on bottom, place wontons on top of leaves and steam for 3 minutes. Serve with lettuce and add some dipping sauce on top. This entry was posted by silvia on September 30, 2009 at 9:14 pm, and is filed under Appetizers, Express - Less than 30 minutes, Pasta, Vegan. Follow any responses to this post through RSS 2.0.You can leave a response or trackback from your own site. Wow. Fantastic. East meats west. Grazie ma questi ravioli sono di Ducasse, quindi i complimenti non li merito io! Ducasse sa fare anche il semplice percio’ mi piace molto come chef. La trovi la pasta da wonton o da ravioli gia’ pronta in Italia? perche’ se devi fare la pasta, ti ci vuole un sacco di tempo sopratutto dopo una giornata di lavoro! The dumpling are scrumptiously beautiful! I love Alain Ducasse as well, and I love the simplicity of this recipe! Beautiful presentation on those dumplings. They sound delicious. I agree with you on Alain Ducasse’s talent! A real gem. Yes, he is an amazing chef, thanks! I tried to make them look as good as his, but I am not quite there yet! Thanks, I tried not to mess them up! Very simple to make. such a unique filling for a dumpling. well done on your dumpling shaping skills, mine are always deformed! So many wonderful and unexpected ingredients. They are really spectacular and I love the colors you used in the photos… Brava! These look ridiculously good! I can’t wait to make them myself.